Here's something that hopefully most of us can agree on. As BC MO's we are already suffering under both high property taxes and high tuition costs. One thing that could make life a little easier for us is having Sundays available to shop without having to trek to neighboring counties. I don't want to rehash all of the arguments for and against the blue laws. They have already been argued ad nauseam here and here and here. I'm just asking for those who agree that the blue laws should be rescinded to please sign & mail in the petition so we can get it a referendum on it for the November election. We are low on signatures and need more help! They need to be received by June 30th so please make sure it's in the mail by next Wednesday (6/25). Petition can be found here. For those who were so concerned, the He'atid Parent Association set up a graduation party for the Kindergarteners next Friday. 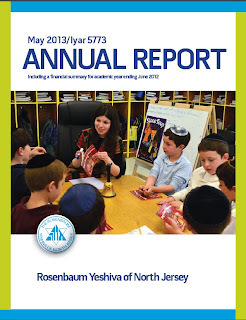 Once again, RYNJ has produced a thorough report showing its finances, budget, etc. Moriah did a similar report for 2012. More on that one another day. I hope all the schools follow suit so we can have an intelligent discussion about school budgets will all of the information being transparent. 2. The "baked-in" tuition is only $200, according to page 18. This is down from $300 last year. Of course this doesn't include what they called "bad debt" (see page 21). I believe this is what they called "delayed tuition payments" last year, because I don't see anything about "delayed tuition payments" this year. They had $300,000 for that figure last year and now they have $30,000 for "bad debt" but I think that might be a typo if they are indeed the same thing. Hard to imaging that it could have changed by 90% in 1 year. Also hard to imagine that in a school of over a thousand students there is only the equivalent of two tuition payments that were not made as required. 3. While small donations have gone down this year, large donations have gone up and it has resulted in an overall increase in voluntary donations that is not insignificant. This tells me that the majority of money raised comes from the top echelon and that as the economy improves so does their disposable income. 4. It was nice to see this comment in the summary: "Our goal is to continue to ensure we provide excellence in all aspects of our Yeshiva without increasing tuition obligations for the foreseeable future." If that is indeed their goal, the increased fundraising will continue to offset inflationary cost increases to keep tuition flat, rather than being used to add staff, programs, capital improvements, etc. The OU had a major voter push for the election yesterday but didn't state publicly whom they were endorsing or why. I didn't wan't to say anything until after the primary election because i didn't want to undermine their efforts but now that the elections are over I'd like them to explain. They pushed for all schools and shuls in the area to vote so there must be something going on that they should share with the community. In District 37, which includes Teaneck, Englewood and Tenafly the only election that had more than one contender was the democratic primary for governor, which was pretty much a foregone conclusion. In fact Barbara Buono won by 76 points. And whoever wins is going to get destroyed by Christie anyway in the general election. Perhaps their push was in District 38, which includes Bergenfield, Fair Lawn and Paramus where there was a close call for state senate. If one of the two candidates has a strong position on school vouchers or anything else that affects our community it's important that we know about it. Especially since that would affect out turnout in the general election in November. If the reason for the silence is that they are concerned about their tax exempt status by being involved in politics we all know that is not true. Tea Party groups & others are doing almost nothing besides politics and they still got to keep tax exempt status despite extensive scrutiny by the IRS. One of the letters from a school or a shul said that we should vote simply to show elected officials that we vote in large numbers. This seems like a very strange reason since we have closed ballots & no one will know in what percentage our community voted. I applaud the OU's efforts to push for legislative solutions to work in tandem with other solutions (austerity, communal fundraising, etc) to solve the tuition crisis, but I wish they would be a little clear on whom they are endorsing and why.